A year since doing our last Loop de Loop submission, my friend Albert and I decided to collaborate on a loop again. Only this time we ended up winning at the Sydney screening. Yay. The L.A screening this time was sponsored by Nickelodeon who held it at their studio in front of about 400 people. 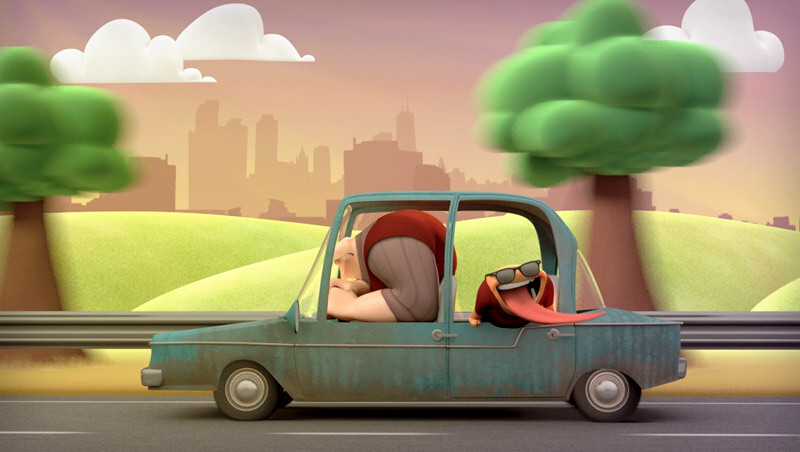 Great to see this little animation community grow. The idea is basically to create an animated loop based on a given theme, then get together in one of four cities and watch them with a few beers. » Watch our clip here. I thought I’d break down a little bit of how we worked. It’s just 12 seconds of animation, so it’s not too different to any of the Animation Mentor assignments. 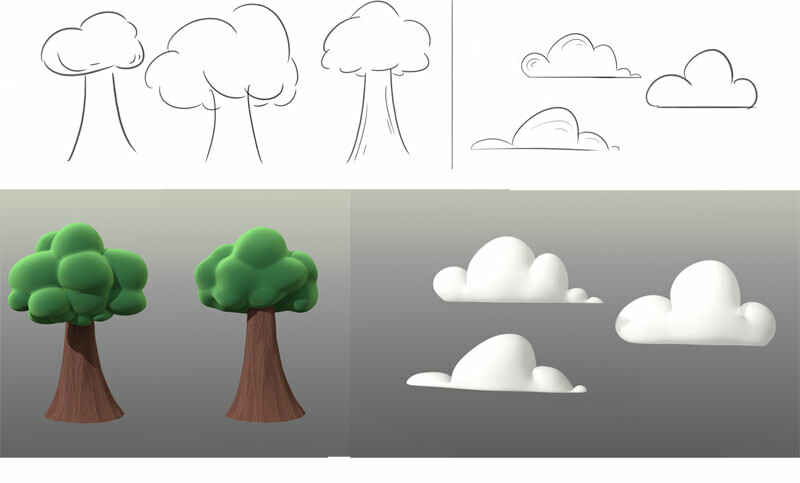 But having to design the set, do final colour grading, give notes on the modeling/texturing, etc actually made the process a lot more fun. We busted it out from start to finish in about 3 weekends and has been one of my favourite projects. Albert is in Australia, I’m in Tokyo so we did everything via email. He likes lighting, rendering, modelling, rigging and I like animation, designing and coming up with fun ideas so our skills and interests compliment each other well. The only thing I felt we are lacking is in the audio side of things, will have to find someone else if we do another clip. The theme for the Loop De Loop challenge was “childhood”. 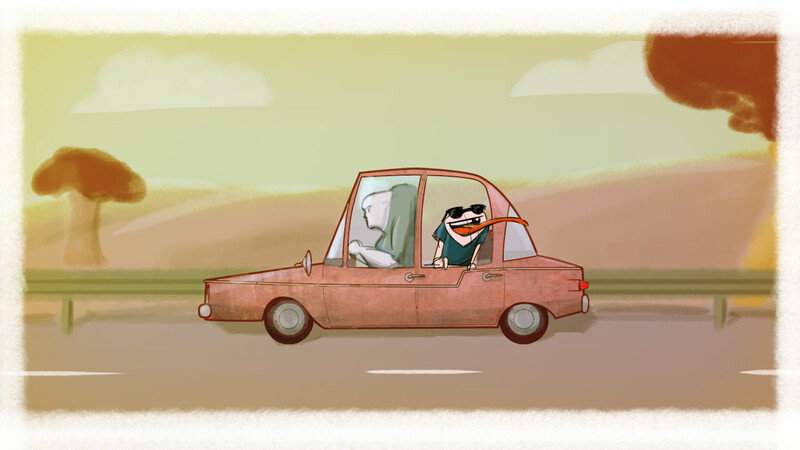 My aim was to do a shot without too much body mechanics so we could hit the deadline with some fairly decent animation. I found the clip of a child laughing on youtube and it essentially narrowed down the possibilities from the broad notion of “childhood” to just a child laughing at something. Having that, it was just a matter of coming up with an entertaining reason for the kid to laugh. It’s quick and rough, but you get the idea. I don’t think anything changed during our production process. My aim was more on getting this done on time than having something for my showreel so there’s nothing special to mention here. I pretty much worked entirely in spline mode and got it pretty much close to done in a couple nights. 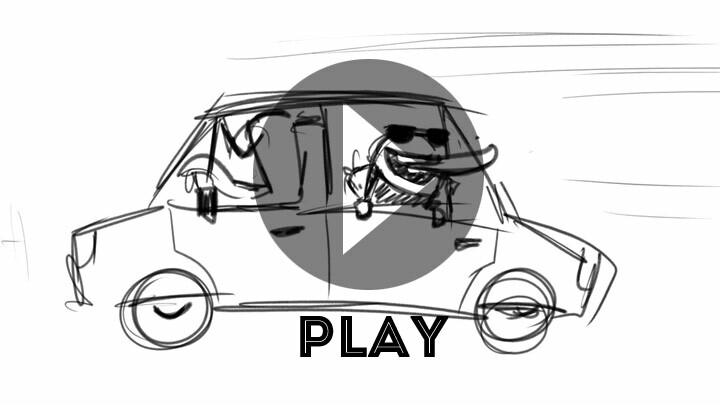 There’s a lot of parent constraints going on to give the car suspension, so Stan can turn the wheel, give some bounce on the sunglasses and Pinky some eyes. 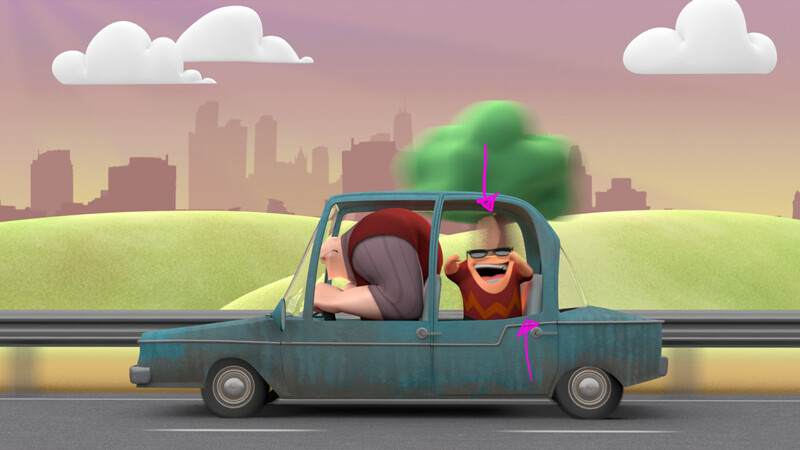 The rigs are from Animation Mentor, we basically just changed the textures on them and as just mentioned, gave eyes to the second kid in the back. I roughed this sketch out to get a sense of colour and environment design before hitting Maya. I spent a lot of time on colour variations in Photoshop but found I was getting nowhere so decided to finalise it once we had some of the set modelled. Hopefully here you can see how the set/design process went down as a collobaration. I liked that I could send simple sketches to Albert and he could come back with his own spin on them. Albert likes to work in Modo, so I supplied an alembic cache (basically it bakes out all the animation) of the character animation. He cleaned all the unnecessary parts that came with it, applied some sub surfacing scattering to the textures and then pulled it into the lit set he was working with. We rendered *almost* everything in the one go, the environment, characters, motion blur, etc. There’s not that much going on in post. To keep our rendering times down we had fairly low quality motion blur, which looked a bit extreme on the truck. 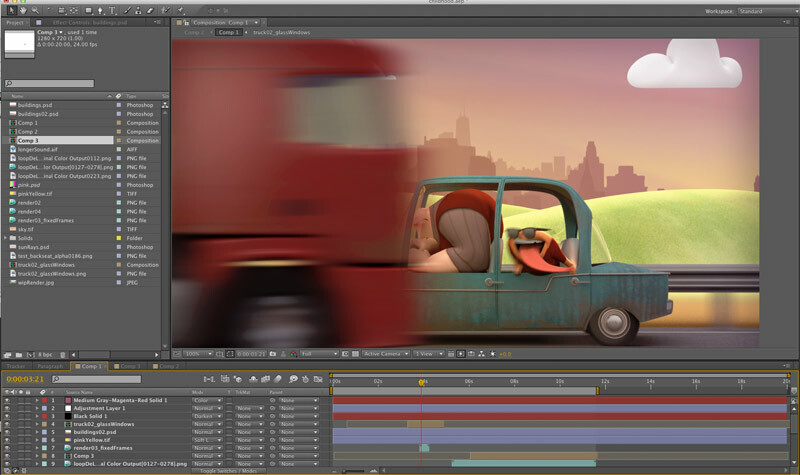 So we rendered the truck separately and applied motion blur in After Effects. We also did some quick reflection fixes on things we hadn’t spotted before rendering and applied a bit of a colour grade. I find colour grading is incredibly complex, so not sure if I actually improved the renders by tweaking with it. Loop de Loop is an awesome bit of fun. To enter something, to go to the screenings, etc is all free. They are currently raising funds to make it even bigger+better, so if you’re interested in the event be sure to through some support at it on Indiegogo. This entry was posted in Process on October 4, 2014 by Tim.